Autumn has already made way to mellow afternoons and relatively cold evenings here. Cold only as much as Mumbai can get! The season will not last much so we try and make as much of it as possible. This is the time to tuck in all those forbidden treats and wash up with hot piping soups on chilly evenings. Do you have some wonderful recipes for soupy treats? Great! I am looking forward to getting inspired and cook up light dinners. Meeta of the very elegant and stylish blog, "What's for lunch, Honey?" organizes a lovely Mingle each month and this month it is being hosted right here, on Tongue Ticklers. 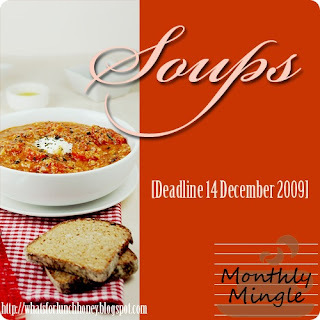 Do join by sending us your favourite heart-warming soup recipes. The theme is "Soup for the happy soul", so you can be sure to send your stories and bit of laughter along with the soup! Create a dish that fits the theme 'Soup for the happy soul' - only vegan or vegetarian recipes not involving eggs - please. Post about it on your blog between today i.e., 22.11.09 and 14.12.09. (Entries must be in English, please). Your creation must exclusively be prepared for this event and cannot be submitted to any other blog event. You must provide a link to this announcement post and Meeta's post and send the details called for below (please look up for links at the end of the post). If your recipe is inspired from a cookbook, site or blog please acknowledge and provide a direct link to the source. Please send a mail to 'sunshinemomsblog [at] gmail [dot] com' with the following details. If you do not receive an acknowledgment within 5 days please leave a comment and I will get back to you the same day. Name of your blog and its url. Name of the dish and url of the post. A picture of the dish 300pixels wide. We appreciate it if you could include the logo but it is not a compulsion. Tongue Ticklers...... has been chosen by well known blogger Raaga - The Singing Chef for T&T. Please look up the recipe link and shoot me a mail with the subject T&T if you would like to discuss any of the recipes.